How can I get reviews for all products at once? Save your time consuming by One-click of Oberlo Integration function. From version 3.3, bulk action feature is integrated to Oberlo. You now can click 1 button only and get reviews for all products without entering URL as usual. Bulk action button is on the top-right on dashboard. Click button and select Get reviews for all products (use General Settings). Keep all imported reviews: Keep safe all imported reviews and get new reviews. 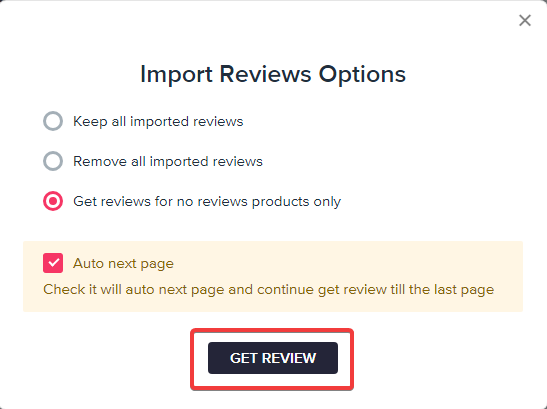 Remove all imported reviews: Remove all imported reviews, then get new reviews. Get reviews for no reviews products only. Remember click “Auto next page” - auto next pages and continue get review till last page. Note: This function is available on Unlimited Package only.